Running for office is not only a decision of time but certainly of money. Regardless if you are running for local office like the school board or national office like senate or congress you need to raise money to run your campaign. Typical places to raise money for your campaign are by asking your family, friends and voters who support your platform. But, what happens when you’ve tapped all of those resources? You need to expand your area of ask, if you will. You will have to ask people to donate to your campaign that you don’t personally know. The good news, it’s easier than it used to be with the advent of social media and digital marketing. When running a local race, time is money. A lot of people announce their candidacy 30 days out and typically, don’t spend time on fund raising. Which, is unfortunate because if they had just $5,000 it would make a big difference in the amount of votes they could connect with about their platform. One of the problems candidates run across is how do they raise money. You can go to online payment processors like Stripe but the problem is they usually ask for an EIN or corporation documents. But, you’re not raising money for your business, you’re raising money for your candidacy, so now what? Paypal! You can certainly use Paypal, you will want to make sure you keep track of all of your donations. Who donated, how much they donated, when they donated, etc. You will need this information for the election office, particularly if you get audited. Another option is to use Raise The Money, https://raisethemoney.com, to help you with your fund raising efforts. Raise The Money has a number of benefits to help you in your fund raising efforts. First and foremost, you can be up in two days, not two weeks as with other payment processors and they offer marketing tools to help you raise more money. Matter of fact, candidates who use them have found they raise 17% more money from previous platforms they’ve used. 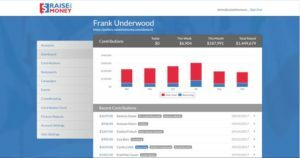 Given that Raise The Money started in 2014 and they have put over 5,000 campaigns on their platform they help a significant amount of candidates raise money for their election. One of the ways they do this is by optimizing your fundraising ability at the local level. They accomplish this by helping you put a “Donate” button on your social media and your website. It is very important to give your supporters an easy way to donate to your campaign. Raise the Money is the only fund raising company that has the ability to put a “Donate” button on your Facebook page. $5,000 may not seem like a lot of money for a campaign but that could go toward sending out post cards, running Facebook ads or using software to help you manage your campaign all in an effort to reach, engage and activate voters. Another factor to consider is to test your fundraising options. Create different forms that have different colors, different amounts, etc. and track them. You will see marked results. 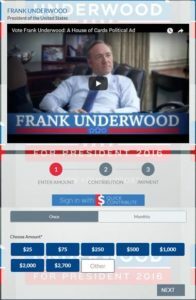 Take a look at the fundraising example with notorious politician “Frank Underwood” (played by Kevin Spacey in Netflix’s House of Cards.) You can see how easy it is to donate to a campaign and to test different elements. Have an easy platform to raise money – find a platform that is more than a payment processor. Find a company that specializes in campaigns. Put a call to action in every single post you make, give an easy way to donate to your campaign. Keep it simple. Raise The Money isn’t just for local campaigns. Gov. Hutchinson of Arkansas uses this platform to raise money for his campaign. Adam Burris is currently the Chief Technology Officer for Raise The Money. Check out their blog to get even more tips on running your campaign.